This is a summary for Brinley from 18-18.5 months old. Sleeping started out rough for naps during this period. She was teething and she had a cold. At first I thought maybe the ‘cold’ was just her sinuses being inflamed from teeth pressure, but then a cough started up so I knew it was actually a cold. One day, she woke up after a 1.5 hour nap, which just isn’t long enough for her. I checked her video monitor and saw her pants were off and were on the floor along with her blanket and everything else. I went in, put her bed back together, and put her pants back on her. I put her back in bed and told her to go back to sleep and left. She got very mad and cried for about a few minutes, but then she fell back asleep and slept for another two hours. Once I was sure she had a cold, I started using Baby Vics on her feet and chest at sleep times and she went back to sleeping well. That is the best thing for her when she has a cold. Eating is continuing on as usual. She is still improving her food dropping, but if it is too close to nap or if she is done eating, she will start sliding her food to the ground. She doesn’t like food in front of her once she is done. When she doesn’t drop it, she will hold it out to us for us to take it away. During the same period when she wasn’t sleeping as well, she wouldn’t do Independent Playtime as well. She cut a molar during this period and is close on a second one. Last time, I told her how she loved to say no to every question. She started to use “no” when she meant no and “yes” when she meant yes. 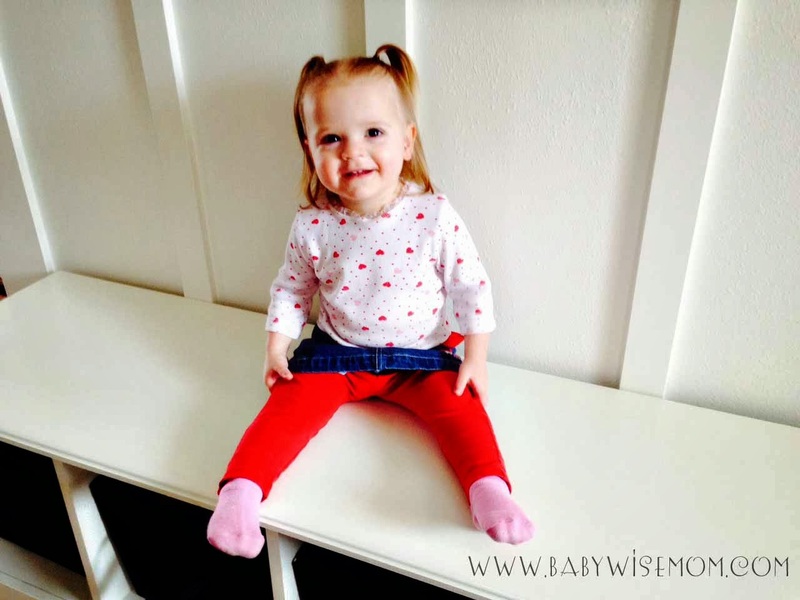 There is something about turning 18 months old–they just suddenly act so much older! And the personality just starts to ooze out. They have a personality before 18 months of course, but it really starts to shine in big ways and you see all of their quirks and get to know who they really are a lot better once they turn 18 months. Brinley said her first sentences during this period! One day, we were playing ball (she loves to play with balls). We were passing a basketball back and forth. Then she got tired of it and said, “No the ball!” How exciting! After that, I noticed her saying lots of sentences. A classic was “Ha ha! Oh I so cute!” (only she pronounces it “coot”). Brinley went to the doctor during this period. She is pretty much 50 percent on both height and weight. She is doing well in all areas. One thing that came up is that our state now allows at 18 months children getting all of their boosters required for Kindergarten. It has previously been done at age 5 (or almost 5 if the child isn’t quite 5 at Kindergarten registration time). Brayden and Kaitlyn got them at almost 5 and McKenna hasn’t quite had hers yet. I vacillated for a moment. It isn’t fun to take an almost-five-year-old to get vaccinations. They are always scared. I thought it would be nice to have it done now so we don’t have to worry about it in the future. But I also remember Kaitlyn having a strong reaction to the vaccinations and I thought that seemed like it would be too much for a little 18 month old body. I didn’t get them for her. I don’t know exactly what I will do in the future. I might consider getting one at age 2, then one at 3, then one at 4. Or maybe 3, 4, and 5. But I don’t really want her thinking every time we go to the doctor will equal vaccinations either. I could just wait and get them all at 4. Like a friend pointed out, my children don’t go to daycare and aren’t in a situation where they are exposed to a lot of things so it isn’t like she is at high risk. Have you had any experience with the "18 month sleep regression". I have a babywise baby who has been a really good sleeper. I havent had to hold or rock her, she has always been put in her cot and fallen asleep easily with her blankie sleeping about 11 hrs. Suddenly last week she has just refused to sleep or nap unless I am in the room. I have resorted to lying on the floor back turned to her until she is asleep and then creeping out the room until she wakes and we repeat it. She screams at the top of her lungs unless I go in, she went 2 hrs straight the other night until I eventually caved. I have read that this can be normal at this age but wondered if you have any advise?